The flag representing the historic county of Oxfordshire, the ‘St Frideswide Cross’, has been hoisted above the department's offices. 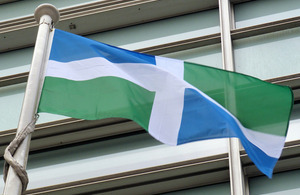 To celebrate the important place counties play in the nation’s cultural heritage Secretary of State Eric Pickles has asked that English county standards be flown alongside the Union Flag outside DCLG’s Eland House headquarters in Victoria. Mr Pickles raised the first flag - for his adopted home county of Essex - in a ceremony also attended in September by celebrity astrologer and long-time English county campaigner Russell Grant. Flags are being flown for a week at a time in alphabetical order or - in cases such as Cornwall and Yorkshire - to coincide with particular county days. The Union Flag rightly has pride of place outside the department but I’m delighted it will now be flown alongside our traditional and ceremonial county flags. England’s counties continue to form an important part of our cultural and local identity in this country and many people remain deeply attached to their home county. This sense of pride and shared identity is 1 of the things that binds communities together and it’s right that the government department responsible for communities and local government should be actively recognising the important role they play. Oxfordshire is a county famous for its university and its science and technology industries and car-making on the one hand and for Winston Churchill, Blenheim Palace and a fair share of the Cotswolds and the Chilterns on the other. We are the most rural county in the South East but we have made and will continue to make a real contribution to English and British life. The fair people of Abingdon, Banbury, Bicester, Chipping Norton, Didcot, Henley, Oxford, Thame, Wantage and Witney and all points between are proud to have their county flag flying at the Department for Communities and Local Government. I am proud that our county flag will be flying at the Department for Communities and Local Government in London. I am an Englishman who is proud of his country - and this nation’s network of counties is integral to what being English is all about. Our contribution to the region and the capital’s status as the engine of the UK economy is important to us here in this ancient yet modern shire. The department is obliged to fly the European Union flag during Europe Week (week beginning 9 May) under Article 7(2) of EC Regulation 1828/2006. The Oxfordshire flag has been kindly loaned by the Oxfordshire Association at no charge.